DESCRIPTION: The tongue is dark to avoid sunburn. Many people notice this snake's white chin. The Florida black racer is a non-venomous snake that is found in urban and rural areas of Florida and the Florida Keys. Because of their uniform black color, they are often mistaken for king snakes or hognose snakes; however, they are more slender and when spooked they quickly flee instead of freeze when approached. Black racers sometimes have white scales under their skin, and their belly is a solid black or dark grey. Juvenile Florida black racers look completely different from adults. When born, they are normally between 6 and 9 inches. Their body is gray or tan and they have rounded reddish or brown blotches going down their spine. They have large eyes and their body turns completely black when they are about a foot long. 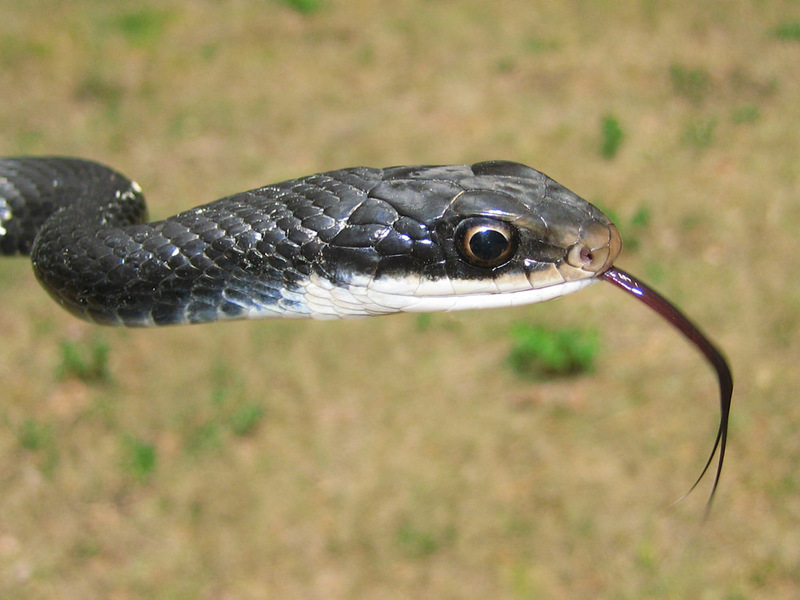 Black racers are seen often because they hunt during the day and are more active during warm weather. They climb trees with ease to get away from predators like large birds, other snakes, or mammals. They sometimes rest or sleep in trees as well. When they hunt they swallow their food whole. They eat a variety of animals like small birds, rodents, frogs, lizards, and even insects. Spring is mating season for the black racers. The females can lay more than 30 eggs during the early summer. They like living in what are called “edge habitats”. These include old fields and the edge of forests and wetlands. They are also attracted to farm fields where rodents often search for food. Though these snakes are not poisonous, they will bite when cornered. They sometimes warn of an impending bite with a buzzing sound made by vibrating their tail against fallen leaves. The black racers’ teeth are very sharp and will make you bleed if they bite you; however, if you do not bother them, they will not bother you.